Vermont artist, Meryl Lebowitz, has been creating unique visual art for more than 30 years. A self-taught oil painter, Lebowitz has experimented with painting not only on canvas and paper, but on a variety of unlikely surfaces, from violins to scrap metal. Her paintings range from the realistic to the surrealistic, often combining photographs with the painted image. 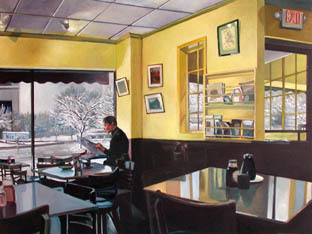 Her subjects are familiar: local faces and landscapes, the interior of her studio or favorite restaurants, friends and family, but their appeal is universal. 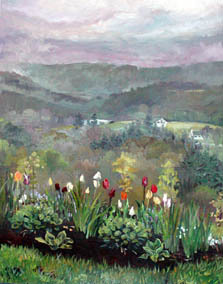 Her award winning work can be found in collections throughout the United States. 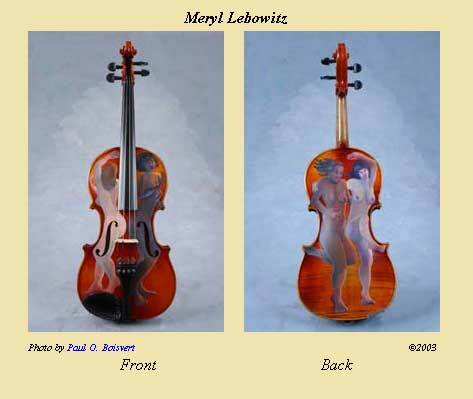 Meryl Lebowitz was born in Glens Falls, New York, in 1951. “Making art was always my favorite activity and I remember ruining many bedspreads and carpets by spilling india ink.” In 1964 she completed her first oil painting, “Brother Matt’s Baby Shoes”. 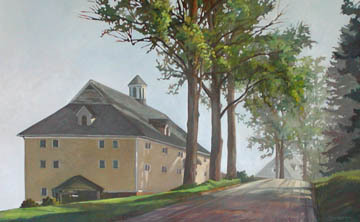 Lebowitz attended the State University College at Oswego from 1970-1974, receiving BS in Art and Elementary Education and a BA in Studio Art. She began teaching art in middle school 2 weeks after graduating, and continued for 3 years. In 1977 she moved to Concord, New Hampshire and married. Her work was signed “Meryl Keegan” for the next 20 years. In 1978, Lebowitz and her husband moved to Lyndonville, in Vermont’s “Northeast Kingdom”. Her two sons were born in 1980 and 1982. While they were young, she taught art to special needs students and worked for “Very Special Arts Vermont”. She also worked as the Arts in the Schools Coordinator at Catamount Arts in St Johnsbury, Vermont. 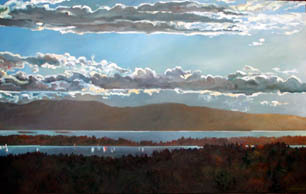 In 1988, Lebowitz and fellow artist, Ellen Levitt, established their own art school in Lyndonville, Vermont. For 4 years they offered a variety of classes to children and adults. They also began producing a line of jewelry called “Alchemy Wearable Art” which was made from found scrap metal. Not only was their one-of-a-kind, environmentally correct jewelry the subject of many newspaper and magazine articles, but it was recognized nationally when featured in a syndicated CBS news short. In the late 90’s, both artists abandoned the jewelry business to pursue their individual artistic interests. Lebowitz began devoting full time to her painting, continuing to study portraiture and landscape, while experimenting with photographic images. 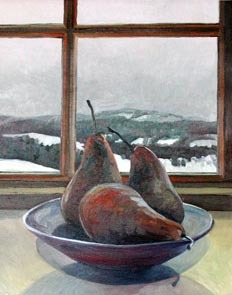 Her work was published in a number of magazines including Vermont Life, Art Calendar and Artists' Magazine. In 1999, after having divorced 4 years earlier, Lebowitz returned to her maiden name. She began to divide her time between Lyndonville and Burlington , Vermont, introducing city-scapes and water studies to her body of work. In 2002, she married David Tanych and they began working on their home and art compound in Kirby, Vermont. 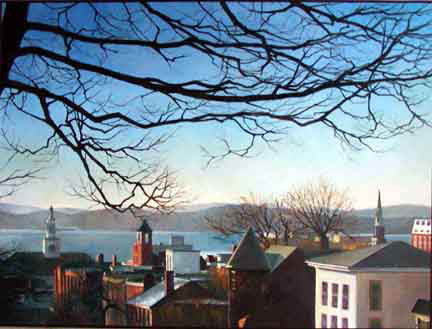 Meryl Lebowitz is represented by Frog Hollow in Burlington, Vermont, the Vermont fine Art’s Gallery in Stowe, Vermont and the Furchgott & Sourdiffe Gallery in Shelburne, Vermont. For the past 15 years I have been exploring oil paint on a variety of surfaces, however, I’m driven by a strong desire to create in any medium. My subjects are very personal: the people, places and things that I encounter in my daily life. Inspired by my love of changing light and seasons, humor, and a need to record my time on earth, I aim to pull viewers into my world, while connecting them to their own memories.